Two of eight people arrested following Saturday’s rioting in east Belfast have been charged with riotous behaviour. Police said they fired plastic bullets three times during the violence. Water cannon was also used as officers came under attack from over 100 people, throwing petrol bombs, stones and fireworks. One officer was injured. 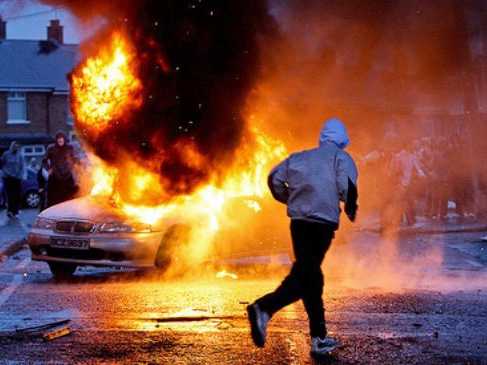 It was the third consecutive night of riots in the area, linked to protests over the decision not to fly the union flag above Belfast City Hall all year. Church and political leaders are due to meet in east Belfast on Sunday afternoon to try to bring an end to the violence. Police Supt Paula Hillman said officers were being subjected to “sustained, serious, violence”. “They are being attacked with petrol bombs, masonry, and bricks,” she said. “Lasers are also being used against police officers and those in the police helicopter.